Until this point, Cath’s life has revolved around her twin sister, Wren, and Simon Snow fanfiction. But when college begins and Wren decides they need to live separately and meet new people, Cath finds herself adrift. Cath isn’t like Wren: she isn’t bubbly and outgoing. For Cath, even the thought of the cafeteria and all its inherent social dangers is enough to keep her in her dorm room, eating power bars. How is she supposed to survive college when her guaranteed friend for life is leaving her and Simon Snow behind? 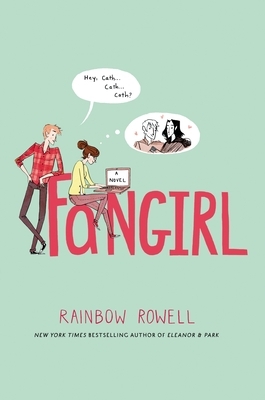 Fangirl was one of those books talked about everywhere in 2013. If you were in any way involved in fandom you heard about it. If you were on Tumblr or Twitter, you probably saw it discussed. If you love John Green, you probably read his glowing endorsement of Rainbow Rowell. If you read YA fiction, you probably read Eleanor & Park and wanted more from Rowell. If you were living under a rock, you probably still managed to hear about Fangirl. After so much positive buzz from a group of people, superfans, who generally feel like the world doesn’t understand them, I was anxious to read Fangirl. Although by no means an avid member of any fandom, I do have ties to several through close friends and an inherent geeky love for all things sci fi/fantasy. Fangirl seemed like a perfect choice. My biggest complaint about Fangirl, is that most of the characters were unlikeable. I would even go so far as to say I actively disliked most of them and did not care about their well being. Even Cath was very hard for me to embrace as a main character. I am fairly introverted and understand exactly what it feels like to dread new social situations, but I identified less with Cath than I expected. I understand Cath suffers from severe anxiety, but there are ways to overcome that, or, at the very least, find a balance. (Frankly, with her family’s psychological history and her own anxiety problems, I am surprised Cath wasn’t already visiting a therapist.) I also understand that a lot Cath’s decisions are reactionary, but it was frustrating to see her whine and complain (especially about her fiction writing professor who, in my opinion, went above and beyond), and then retreat further into herself. If Cath had been supported by a cast of outstanding secondary characters, I might have liked the book more than I did. Unfortunately, even they lack likeable personalities. Wren is a truly terrible sister and a pretty awful person in general. I don’t have a sister or a twin, but this relationship did not ring true to me, especially for siblings who had been as close as they were for so long. Levi was charming, but his behavior was hard for me to understand and I just didn’t get him as a love interest. (I also didn’t understand his physical appeal based on Rowell’s descriptions. A “forty-acre forehead” sounds ridiculous.) The only character I liked overall was Reagan, the roommate. She was brassy and no-nonsense, but she did more to push Cath out of her shell than any of the others. In the long run, even Rowell’s breezy writing style couldn’t make up for her characters. The other major area where this book failed for me was the fandom. It felt forced and I wonder if the book would have been better without any of it, if it were simply about Cath adjusting to college and breaking out of her shell. Initially, I assumed the Simon Snow series was supposed to take the place of Harry Potter in this world. But an off-hand remark by one of the characters blew that theory out of the water. I was actually really bothered by that. So much so that I had to stop reading and vent about it to a friend. I find it difficult to believe that a series as universally popular as Harry Potter, that spawned a billion dollar movie franchise and a huge fandom, could be overshadowed by another series that not only overlapped it in publication years, but felt like a direct copy. That just isn’t possible. It would have been better if Rowell had avoided any mention of Harry Potter at all in her book. I also thought the excerpts from the Simon Snow books and Cath’s fanfiction were a mistake. The excerpts were so short and out of order, that they didn’t seem to accomplish much in bringing Simon Snow into the story. If they weren’t so short, I would have ended up skipping them. Additionally, I found Cath’s fandom activity suspiciously vague. For someone who claims to have many friends made through online fandom, she spends hardly any time talking to them or interacting with them. Did Cath just make those fandom friends up to get Reagan off her case, or did she actually spend time interacting with them that we didn’t see? Without proof that Cath actually has fandom friends, I can’t buy her insane popularity within the fandom. I will admit that part of my intense dislike for Fangirl is my fault entirely. I let myself get distracted from the plot. Once I started nitpicking the details of Fangirl, I just couldn’t look beyond them and see the potentially great story underneath. I couldn’t get over the absurd descriptions of Levi’s teeth, or the pointless Mom plotline, or thinking Cath was clueless for not knowing the difference between a farm and a ranch despite growing up in Nebraska, or her complete inability to understand Levi’s dyslexia, or the horrible pacing, or the open ending that answered no questions. By the end of the book, I was so frustrated with the little things that I couldn’t see the decent book underneath. Despite my overwhelmingly negative feelings towards Fangirl, I will say there are some things Rowell did well. Her writing style easily pulls people in and makes them want to keep reading, and her dialogue really pops. Most importantly, Fangirl does a fantastic job addressing why people write fanfiction and crave fandom interaction. Cath’s reasons for writing fanfiction and immersing herself in Simon Snow’s world will resonate with many people. If for no other reason than that, Fangirl is groundbreaking novel. Recommended Ages: Could easily be considered New Adult, but also works for 16+. Includes language, drinking and sexual situations.